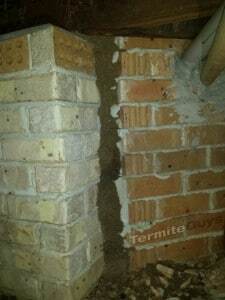 Termite News and Tips Termite infestation found in brick home in victoria point. Termite infestation found in brick home in victoria point. Yesterday we carried out a termite inspection at a home in victoria point as the owner had found the internal stairwell had given way. You can see in the photos below the large entry points. The termites build these mud tunnels to protect themselves from other predators like ants and to keep themselves from drying up. Termites spend most of their lives underground and need to stay moist. The termite damage seemed to be confined to the softwood internal stairwell, although there wasn’t much left of that. The top side of the stairs was carpeted and without noticing that the stairs were getting soft, there was no other way for the homeowner to detect the termite infestation without crawling under the house in the sub floor area. Two entry points were visible from under the house, but other entry points were concealed. Termidor Dust was used to eradicate the termite infestation on the day followed by the Termidor soil treatment 10 days later for long term ongoing protection. Termites can be found in every suburb in brisbane and homeowners need to be vigilant. 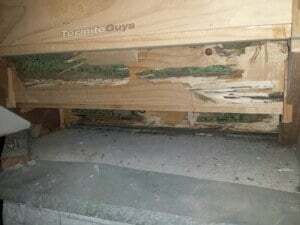 Most termite infestations are difficult to find as the damage is usually concealed behind the walls and most termite entry points are under the ground either through plumbing, service points , over the edge of the slab, through cracks or joins in the slab and poor mortar work. In some cases termites can even fly into the building and establish themselves in the house without having contact with the ground. Termites do however need a moisture source which can sometimes be difficult to identify without the proper equipment and training in thermal imaging and moisture detection. Been a while since your last inspection? Book online and receive $20 off your inspection. 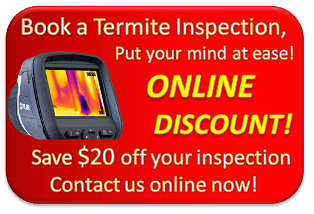 Our technicians are fully equipped to locate, destroy and prevent termite infestations. It is important to keep a look out yourself, but you should leave it to a professional at least once a year.